Social media has provided many new methods to generate prospects, build your brand, and deliver support to customers. Companies not utilizing social channels often find traditional methods considerably less effective than the social counterparts. As easy as it is to break into social media, discovering what works can be daunting. For example, social media campaigns can seem very similar to one another yet have very different aims. 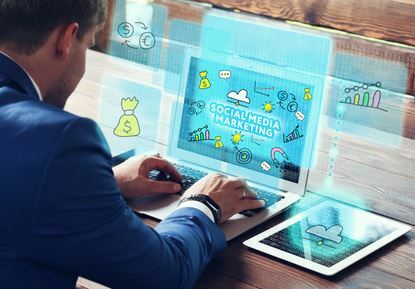 Each piece of the social machine works together almost seamlessly; marketing and selling socially are regularly lumped into the same social media category. To be successful at social selling, it is important to remember some key factors that separate sales from other social media tactics. First and foremost, social sales requires the quality content from social marketing to be effective. Your marketing team generates the targeted leads your salespeople interact with to encourage sales through rich customer relationships. Prospects may come through your webpage after using a search engine, while others may have found your site through a targeted social ad campaign. Each individual will have unique needs and goals to address. The more valuable content your marketing team has created, the more resources your social salespeople have to develop relationships with your customers. The more relevant the content is to your product or service, the more helpful the material will be for social selling. Social selling goals are more than just a tally of products sold and customers gained. Because the focus is on developing relationships with customers, your goals may not involve direct sales at all in the beginning. The overall goal is to increase customer service and establish a standard for your salespeople to follow. Each team member’s account may keep track of how often they are specifically requested, how developed their prospects are, comments or referrals from satisfied customers, or other similar statistics. Any one of these could be a crucial element to grow your social presence and sales. Social selling is different from traditional sales. Pushing a sale with a sales pitch can easily deter interested prospects through social media. The idea of social selling is more focused on developing the deeper relationships with individual clients than meeting a quota. Gaining a customer’s trust by being authentic instead of outright selling may call for additional training for your sales team. Setting up a team dedicated to social selling and teaching them how to use the social tools available will increase the sellers’ efficacy as well. As the sales team cultivates individual relationships with customers, they will uncover new information about the needs and goals of your target market. As social marketers provide sellers with content and tools to use, sellers can also provide marketers with questions and problems that lead to valuable content the sellers can use. While it may take some work to set up the cycle, both marketing and sales will benefit from the effort. In social marketing, it is key to consistently generate quality content to keep the audience and followers coming back for more. The same is true for social selling. Instead of generating content, however, your sales team is fostering more richly developed leads and cultivating customer retention and referrals. It is important to establish a standard of quality to ensure your social selling is consistent as well. This may not be a number to maintain, but rather a collection of activities and gains. Clients who regularly purchase higher quantities in the long run may require more time to maintain a relationship than the average customer, for instance. These types of rich relationships must be balanced by attention to the overall quality of customer care. Understanding these key activities to social selling not only cuts through the confusion, but also enables you to create a unique plan for your company. At the core, social selling should be about personalizing the customer’s experience with your company before and after the sale.